Walking on a treadmill is a great way exercise. Treadmills are the most popular home exercise equipment, with 33% of the sales, according to Sporting Goods Business magazine. Treadmills are also an effective way to exercise indoors. Studies found that treadmills ranked number one among exercise machines in burning calories. While you could use an elliptical trainer, indoor cycle or other exercise machines, more people find it easiest to walk or run on a treadmill for exercise. Which Treadmill Should You Use for Walking? Having a home treadmill can eliminate many excuses for not doing your walking workouts. It can be a big investment, with good quality treadmills selling for over $1000. It is often a good tactic to buy a better quality used treadmill than to buy the least expensive new treadmill. Before You Buy a Treadmill: what to look for when shopping for a home treadmill. You don't want to end up with a flimsy or under-powered treadmill that won't last long. Should You Buy a Folding Treadmill? You may want to maximize your living space by using a folding treadmill. The question is, will it just stay folded up or is it easy to set up and use regularly? Finding Free or Cheap Treadmills to Use: How to find bargains for home treadmills, and tactics for using good treadmills at fitness centers, work or school. Should You Use a Treadmill Desk? Slowly walking while you work or watch video is a good way to reduce the bad health effects of sitting too much. But is it for you? Once you have located a treadmill or brought one into your home, it's time to get started. It's wise to slowly and steadily build up your exercise time, especially if you have been inactive. How to Start Walking: Use this plan if you have been inactive. Treadmill Weight Loss Walking Plan: Once you have built up your walking time and speed, use this plan to vary your walking workouts to burn calories and build cardio fitness. 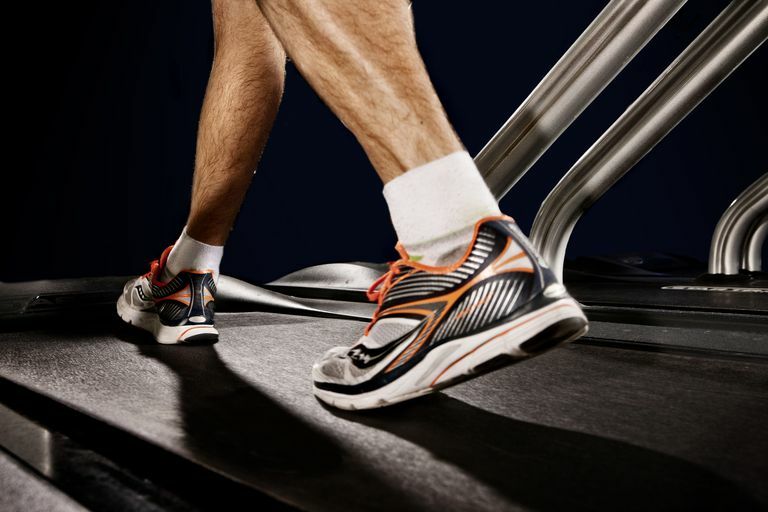 10 Treadmill Walking Mistakes to Avoid: Get started right by knowing what not to do. How to Beat Treadmill Boredom: Stay entertained while working out. These workouts were developed by fitness trainer Lorra Garrick to help you vary your treadmill workouts and pump up the intensity. Treadmill Hill Workouts: Your treadmill may have a hill workout program. Here's how to vary the incline to build exercise intensity. Treadmill High Intensity Workouts: Add intervals of higher intensity activity to boost your heart rate and burn more calories. Jumping Intervals on the Treadmill: These intervals will increase the intensity without having to go faster. Walking Backward on the Treadmill: It may seem a little silly or even a little dangerous, but this is a way you can vary your workout. Treadmill-Dumbbell Workout: Get in a strength workout along with your treadmill time. 20 Best Treadmill Workouts Dave McGovern in Walking magazine describes how to get a good indoor workout. Zeni AI, Hoffman MD, Clifford PS. "Energy expenditure with indoor exercise machines." Journal of the American Medical Association. 1996 May 8;275(18):1424-7. Moyna NM, Robertson RJ, Meckes CL, Peoples JA, Millich NB, Thompson PD. Intermodal comparison of energy expenditure at exercise intensities corresponding to the perceptual preference range." Medicine and Science in Sports and Exercise. 2001 Aug;33(8):1404-10.